How many of you know mother Teresa? If we ask this question, most of the people would think of us as crazy people just posing unthought questions to people. However, how many of you know that Mother Teresa was going through a faith crisis? How many of you know that Mother Teresa, at a time of her life, was unable to decide whether she believed in God or not? There are many such interesting things about the life of Mother Teresa that you might not be knowing. All this, including many interesting facts about the dead saint, we have found out from the book Mother Teresa Canonized or Crucified, a book which is written by Gerard. 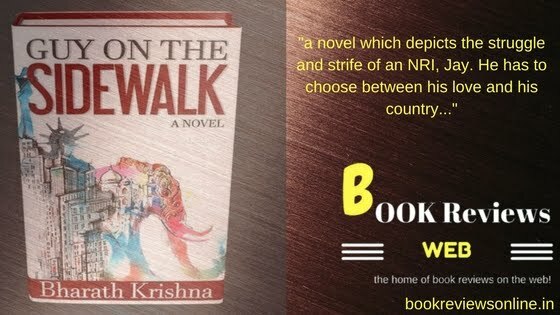 Guy on the Sidewalk is a novel by Bharath Krishna which wonderfully depicts the mental contours through which the NRIs often pass. This is a novel of conflict; this is a writing of sensible understanding of responsibility; this is a novel of a typical dilemma in love - commit or move towards something which needs more of the attention. The author has touched all these vital cores which make this novel a one piece invoking the attention of readers from different groups. Indeed, Guy on the Sidewalk is also a modern novel in its linguistic approach; however, this was the necessary tool to bind the emotions with the characters. Young people do speak like this, no wonder! The leading character in the novel, Jay, who is an NRI and like most of them, still wondering what to do. He struggles with his education, with the training, with getting a job and with his love interest too. Towards the ending of the novel, however, he gets all of these settled. Jay gets a good job and also lives happily with his beloved, Siri. Nevertheless, this is not the point where the novel concludes. The major conflict in the novel begins only after Jay, the Guy on the Sidewalk, gets everything he could wish for - Siri, a job with a handsome salary and a life ahead. The call from inside, an urge to wake up and get back to the land - the motherland, and a kind of disillusion hounds Jay. He is unable to decide what to do and what not to do. He thinks of Siri, his girlfriend, who happens to be the divorcee and mother of a beautiful girl, and also thinks of India, the country for which he wants to do something. The conflict almost takes a toll on their relationship when Jay discusses all these running in his mind with Siri. However, towards the end, Jay manages to coax her mind and he is all set to return to India. The novel ends when Jay wakes up and finds that the plane has landed on the soil of India. He deboards and the first thing he does is calling Siri and telling her that he has reached. What would Jay do in India is now up to the Author Bharath Krishna who might very well come up with the second novel as a sequel to Guy on the Sidewalk! However, asking about the same, when Alok Mishra inquired, Bharath denied that. He told that he would not come up with the second novel in the series. Meanwhile, this is all for us! The novel is indeed interesting and also has one or two intimate scenes which might very well be transformed into sizzling bed scenes in a Bollywood movie! Enjoy the novel guys... and that's all from the #TeamBRW for now!